Adequate, accessible drinking water (recommended one quart per worker per hour). Regular rest breaks or periods in a cool area, in accordance with heat and workload. Increased air circulation, air conditioning, and ventilation. Worker awareness of the early signs and dangers of heat-related illness and the ability to take a break should these signs arise. Work acclimatization for new workers (allow one week for the body to adjust to working in the heat). With outside temperatures starting to soar, now is the time to make sure employers are taking the steps necessary to protect workers from heat stress and heat-related illness. Heat can cause more than just discomfort. Exposure to high heat and high humidity can be life threatening. Employers should make sure workers know the signs, symptoms and appropriate first-aid procedures for serious heat illnesses. For more information about heat and heat-related illness, you can contact the UFCW Occupational Safety and Health Office in Washington, D.C. at 202-223-3111. Extreme heat can kill or seriously injure workers. As summer approaches, we need to be prepared to keep workers safe with the additional stress of hot weather. There are lots of things we can do to protect workers. While employers have a duty to protect workers from heat-related hazards under the OSH Act, it is our duty to make sure that employers are enforcing those protections and workers are safe. When heat and humidity are becoming workplace hazards. What a heat-related medical emergency is and how to respond quickly and effectively. emergency that is well-known to workers. 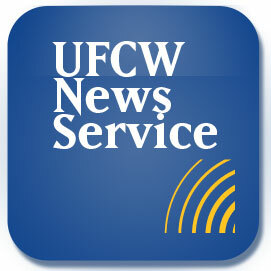 The UFCW Safety and Health Office can provide live training via computer for local union staff and members. 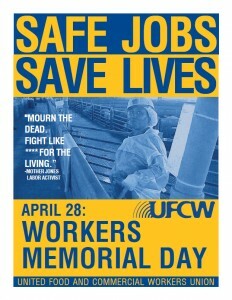 Every year on April 28—Workers Memorial Day—the UFCW joins workers in the U.S. and around the world to remember and pay tribute to the thousands of workers who have been killed on the job and the millions of workers who have suffered from injuries, sickness or diseases in their places of work. While the efforts of union members and their families have resulted in significant workplace safety laws, including the passage of the mine safety law and the Occupational Safety and Health Act, too many workers are still suffering or dying on the job. According to the Bureau of Labor Statistics, over 4,000 workers lost their lives on the job in the U.S. in 2013 alone. And according to the Occupational Safety and Health Administration, 50,000 workers die from illnesses caused by exposure to chemicals and other workplace hazards and millions more will suffer non-fatal workplace injuries each year. Although the Obama Administration has taken action to strengthen safety and health protections, including proposing new safeguards on silica and other workplace hazards, Republican lawmakers and their corporate backers are trying to stop these protections and shut down all future regulations. Republican lawmakers are also supporting right-to-work laws, which make it harder for unions to bargain for workplace safety protections, along with decent wages and benefits. In addition to political obstacles, our country’s growing wealth gap and low-wage, part-time economy has emboldened many employers to cut corners, violate workplace safety laws, and punish those workers who report job hazards or injuries. On Workers Memorial Day and every day, the UFCW stands with workers who are fighting to uphold their basic rights – including safe jobs, workplace fairness and collective bargaining. Working people deserve a safe place to work, and those politicians and corporations that weaken work safety laws and exploit workers for profit and put them in danger must be held accountable. WASHINGTON, D.C. — The United Food and Commercial Workers International Union (UFCW) today released the following statement regarding OSHA’s decision to exercise the seldom-used “general duty clause” of the Occupational Safety and Health Act to protect poultry workers from workplace injuries or death. “The UFCW applauds OSHA’s decision to use the “general duty clause” to protect poultry workers from dangerous workplace conditions, including exposure to unsafe machinery, risk of falling and musculoskeletal hazards. The UFCW also commends OSHA’s efforts to look into practices that result in the failure to manage the medical treatment of injured poultry workers and maintain an accurate record of those injuries, resulting in an artificial injury and illness rate that is used to benefit the poultry industry at the expense of the safety of its workers. The UFCW believes that the safety awards presented by the National Chicken Council and other industry groups to member poultry companies for outstanding safety performance should be reconsidered since OSHA’s findings show that the poultry industry has the ability to conceal the extent to which poultry workers suffer from work-related injuries and illnesses. “The UFCW represents workers at poultry plants across the country, and our union has called attention to the many dangers poultry workers face every day, including ergonomic health hazards. While the UFCW has been successful in curbing some of the workplace abuses in this industry, too many poultry workers do not have a collective voice on the job and continue to toil in low-wage jobs that threaten their health and safety. WASHINGTON, D.C. — Joe Hansen, International President of the United Food and Commercial Workers International Union (UFCW), today released the following statement after the USDA published a final poultry modernization rule. “For more than two years, UFCW members have spoken out with a simple and compelling message: safe line speeds mean safe workers. “With today’s publication of an improved poultry modernization rule, it is clear that the voices of UFCW members were heard loud and clear. “I want to thank our coalition partners in labor, food safety, and the civil rights community for standing side by side with us throughout this process. I want to recognize the Department of Labor for raising important safety questions. And I especially want to commend Secretary Vilsack for listening to our concerns and taking the necessary steps to fix this rule. One of the examples provided in the guide. The UFCW Occupational Safety and Health Office has released a guide that lists the workplace hazards that may occur in a retail workplace. The hazards listed in the guide are all violations of the standards set forth in the Occupational Safety and Health Administration (OSHA), and should be immediately reported to a supervisor and a union steward or union representative. 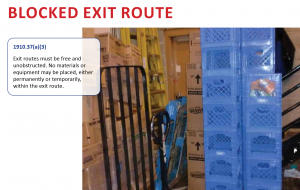 The guide, which can be accessed on the UFCW Safety and Health website, provides photos of examples of the hazards that violate OSHA standards, in order to help workers and supervisors identify and eliminate workplace hazards. Even today, women who work in middle-class jobs across America face pronounced barriers and gender discrimination in the workplace, as exemplified by the recent Demos report on gender inequality in retail wages. However, workplace inequality can manifest in other, more subtle ways – such as the manufacture of products containing Bisphenol-A, or BPA. BPA is an endocrine disrupting chemical, which alters hormone production and behavior, disrupting the body’s normal functions. In a 2012 six-year study, BPA was found to have a pronounced effect on women who work in the automotive plastics and the food packaging industries. 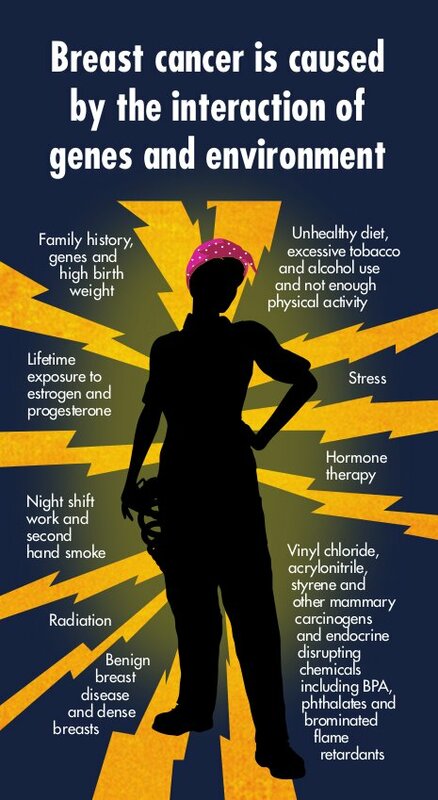 These women are five times more likely to have breast cancer than women who work in other industries. BPA, which is found in the epoxy lining of the metal food can and released into the air during the food canning process, was banned by the FDA in the manufacture of baby bottles, sippy cups and infant formula packaging. Many private companies have taken further steps to remove BPA from products. However, BPA exposure is still a problem for thousands of manufacturing and packaging workers in America. In order to address this problem, the UFCW has joined allies such as the Communications Workers of America, the United Steelworkers, and the United Automobile Workers in supporting the Ban Poisonous Additives Act, or the BPA Act. The BPA Act would remove BPA from food packaging, encourage the development of safe alternatives, and ensure a thorough safety review of all currently used substances in food and beverage containers. It is currently in committee in the House, where it needs to be passed by the House and the Senate and approved by the President before it becomes a law. This brochure, produced by the BlueGreen Alliance and UFCW, contains useful information about the growing problem of breast cancer among working women. 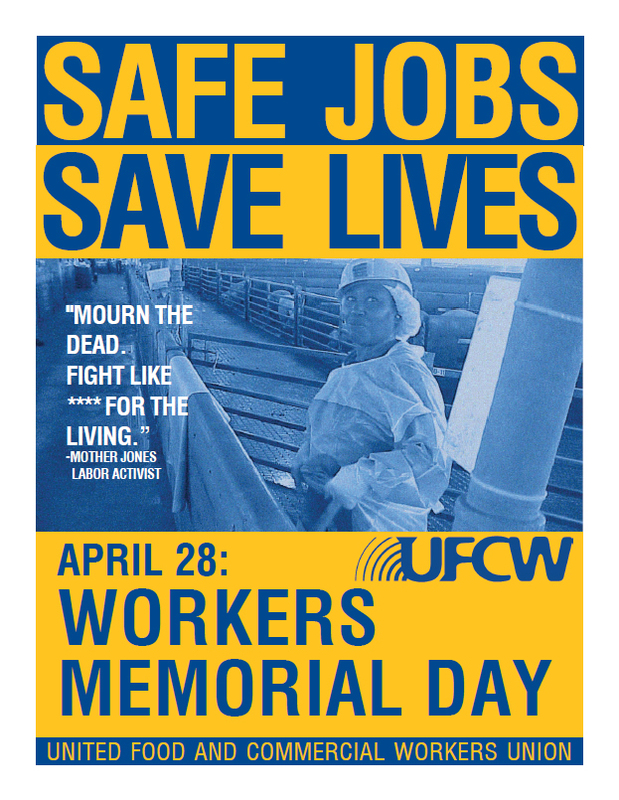 Today on April 28—Workers’ Memorial Day—the UFCW will join workers in the U.S. and around the world to honor the thousands of workers who have been killed on the job and the millions of workers who have suffered from injuries, sickness or diseases in their places of work. While decades of struggle by workers and their unions have resulted in significant improvements in working conditions, too many workers here in the U.S. and around the world are suffering or dying on the job. Last April, our sisters and brothers who worked at the Rana Plaza garment factory in Bangladesh were told to report to work in a building that had severe structural cracks and over 1,100 workers lost their lives when the building collapsed. A year later, thousands of workers in Bangladesh continue to work in dangerous conditions and for meager wages, and survivors of the Rana Plaza tragedy are still suffering from their injuries and loss of income. Here in the U.S., according to the Bureau of Labor Statistics, over 4,000 workers lost their lives on the job in 2012 alone. Workers everywhere deserve a safe place to work, and those corporations that exploit workers for profit and put them in danger must be held accountable. As we observe Workers’ Memorial Day, the UFCW takes to heart the words of activist Mother Jones to “pray for the dead and fight like hell for the living” by reaffirming our dedication to supporting workers here in the U.S. and around the world who are fighting to uphold their basic rights – including safe jobs, workplace fairness and collective bargaining.